Bodypoint PivotFit dynamic front-pull shoulder harness with adjustable length top straps provides the ultimate level of comfort and support combined with ease of use. 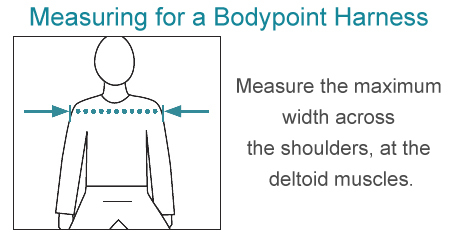 Bodypoint PivotFit shoulder harness contours the shoulders and the rib cage for a more supportive and comfortable fit. Bodypoint Dynamic shoulder harness features the new swivel buckle which is strong and safe allowing for precise pad placement for an individualized fit and also equalizes tension without causing “bunching-up”. For maximum shoulder retraction, consider the trimline harness (worn backpack style). For balanced shoulder/sternal support, choose the Dynamic PivotFit™ for more torso movement, or the standard version for spinal curvature and asymmetry.